Today I am sharing how to add a touch of autumn in your kitchen with just a couple of things. With its reddish-orange shade, copper brings a huge amount of warmth and charm anywhere you put it. And for autumn, copper is a go-to element. 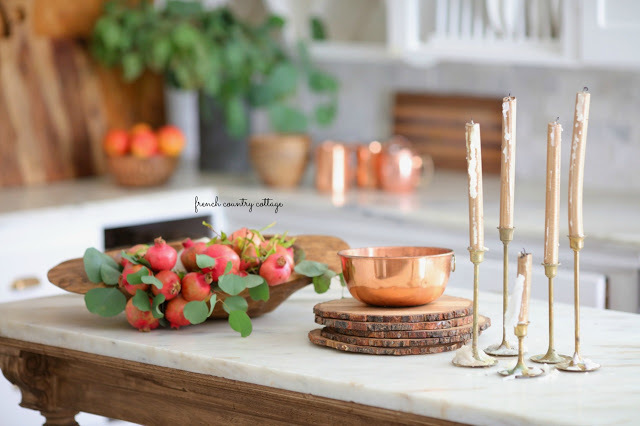 From the everyday pots and pans to the vintage pieces mixed in, copper is a perfect metal to bring in for seasonal decor as well. 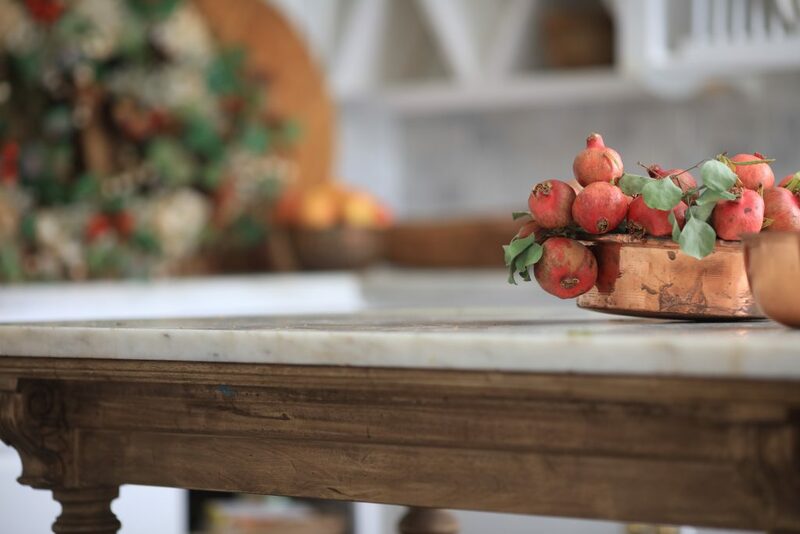 A vintage copper pan filled with pomegranates is perfect on the island. Or how about a copper bowl with a few copper mugs in the background to echo that shiny welcome to the season? Or even a large copper tub and beverage dispenser in the background. There are several great copper options that would be perfect for adding that autumnal feel. Another go-to for my seasonal decor is wood. Chunky slices, stacks of cutting boards and simple, carved out dough bowls are perfect for bringing a natural element to the kitchen for autumn. And of course, foliage. 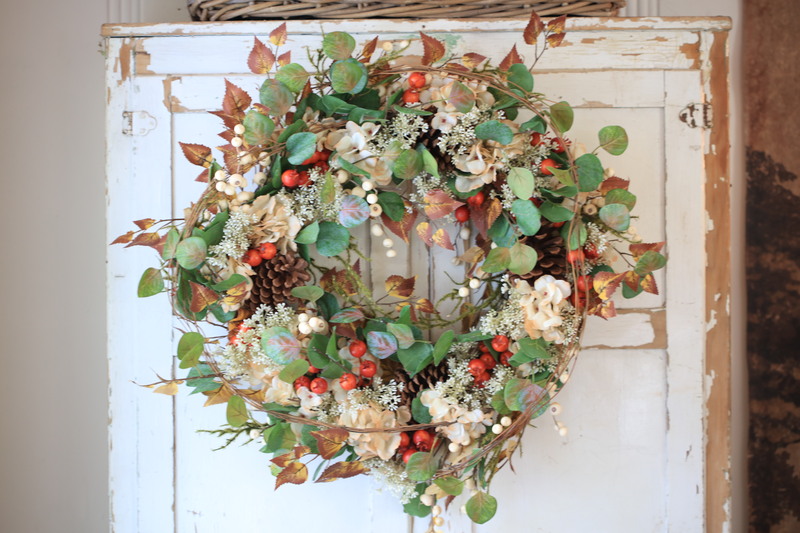 This year, some of my favorite foliage is the Briarwood Cottage foliage. Full of farmhouse charm and subtle colors, it is perfect for adding a touch of greenery and neutral autumnal hues anywhere in your home. 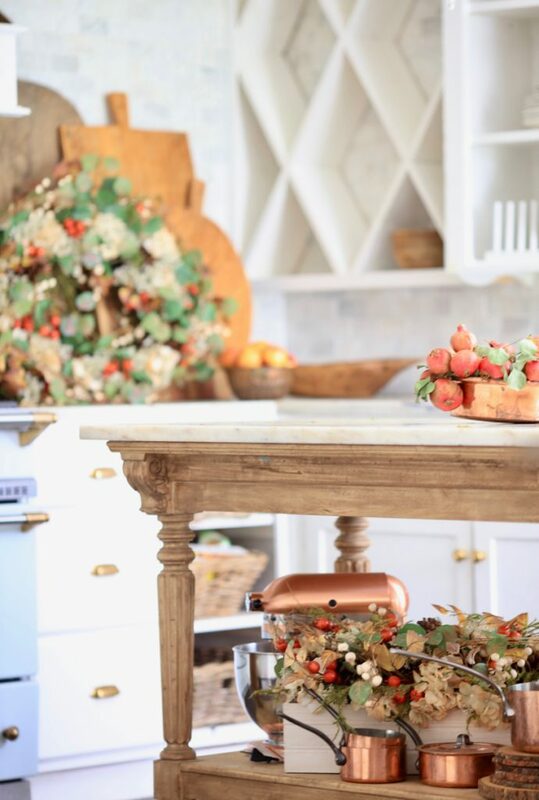 I tucked the arrangement under the island nestled in with copper and wood to create a subtle pop of pretty. And I placed the wreath by the cutting boards for a simple charm. The beauty of this foliage is that it is not overwhelming in color or shouting “autumn!” It brings a very natural, relaxing feeling, making it perfect for display in the kitchen or front door, or simply hanging on a cupboard for year-round charm. Whatever you decide to do to decorate your kitchen for autumn, simple is my motto. 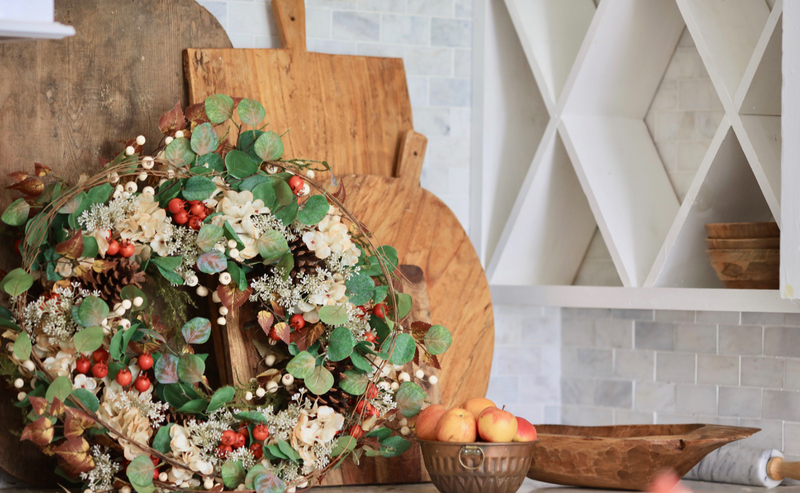 Choosing pretty elements for an everyday country feel like copper and wood, and mixing in a touch of autumn with foliage, is a perfect way to add the right amount of seasonal sprinkle. Its nice to read this article. Nice post. Thanks for sharing this informative information about kitchen decor ideas. I really appreciate it. Great work.